Help us by joining the Basingstoke Heritage Society today. To download an application form go to the ‘contact us’ page. To promote high standards of planning and architecture. To inform the public in the geography, history, natural history and architecture in the area. To secure the preservation, protection, development and improvement of features of historic or public interest. The Basingstoke Heritage Society works with the following kindred organisations. . Simply click on their name to establish links to their own web sites. You can follow and contact us on facebook by following this link. PEACE GARDEN It seems a long time ago since the Peace Garden was opened on Intern ational Day of Peace, 21st September. It was a difficult year to plant a garden because of the hot weather and it will take a couple of years to really come into its own. If you have noticed that the reflective sphere has disappeared for now – then we hope that it can be made secure enough to be returned to the garden. 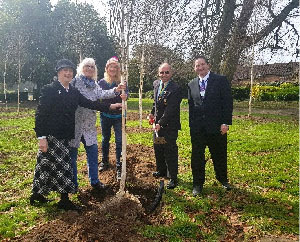 The society had been represented on the Peace Garden Advisory Group since 2014, when it was set up. It was a great pleasure to see the project completed and to meet former patients of Sir Harold Gillies, whose gratitude to him and the work done at Rooksdown was very touching. Dr Andrew Bamji unveiling the bust of Sir Harold Gillies. One of the prizewinning entries by local schoolchildren, cast in bronze and embedded in the garden. We have asked for signs like this to go at two of the entrances to the Holy Ghost Cemetery, where there are 21 graves, mostly WW1. 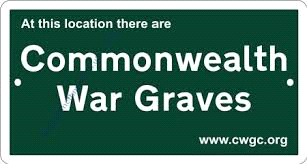 Getting all the consents from the council was quite a struggle, but the application is now in and will be done by the CWGC team at some point. WALLS The May newsletter had some good examples of old walls to be found in the town and here are some more. 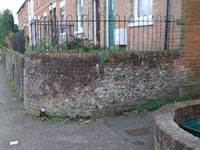 The top left one is in South View and known as a ‘rat-trap’ wall. 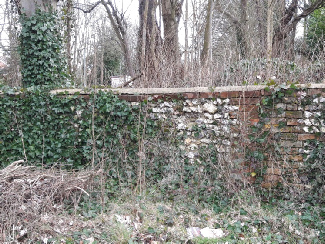 There are a lot of garden walls like this in South View. On the top right is one taken at Viables – near to the former farmhouse. 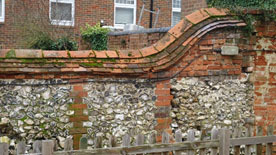 It’s fair to say that we have no expertise in dating these wall – some are definitely 19th century, but others may be older. You may k now that the Basingstoke Gazette office in Pelton Road is for sale. The building is not in good c ondition and will likely be demolished. There is a substantial archive and we have been raising this with various parties for some months. The photos below show the Arab Platen press made in 1860 and purchased second hand by Bird Bros., when they opened their print works in Basingstoke in 1878. The other photo shows print cases, upper and lower. There are also bound copies of the Hants & Berks Gazette from 1879 and later the Basingstoke Gazette and many photos. We would like to see the items in Milestones Museum as they are an important part of not just Basingstoke’s, but north Hampshire’s history. It would be great if the newspaper archive could stay in the town and be accessible to local historians. LOCAL LIST You may recall that we nominated the stub of the Alton Light Railway (near the Waterworks) for the Local List and the council has agreed to add it for its historic value. We also nominated the pavilions at former Park Prewett. These have not been added to the list, but we note that there are plans to keep them safe and are not at the same level of risk as they were. 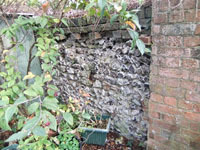 We also nominated The Lamb air raid shelters – also turned down, but since then an opportunity arose to view them from the Cliddesden Road garden and we will ask the council to reconsider as it appears to be an above ground WW2 air raid shelter – the only survivor in the town as far as we know. TERRY HUNT ANNIVERSARY Basingstoke’s photographer was born in 1882 at Silchester and he died just 70 years ago this year on 21st June 1949. He photographed the town and villages around and you may have seen a presentation of his slides at our AGM. They are a fantastic record of the town and many glass plate negatives are held at the Hampshire Record Office in Winchester. The Squirrel in Joices Yard had this interesting object. The family dated back at least to 1891 to William H Rogers, born Amesbury, 1828 and his wife Sarah, born in Newbury were resident in Basingstoke. He was a coachbuilder-smith and his son and grandson were plumbers and gas fitters in Sarum Hill.  She describes riding out with her father to Roman Road. It was not tarmacked and she described the Roman paving with cart ruts still visible.  She recalled the Board School (Fairfields) built when she was about three. There were a ‘tribe’ of Blatch cousins, and her mother organised a kindergarten taught by Edith Wallis. She describes being regularly abused by the Board School children when they passed through Castons Entry!! WINKLEBURY IRON AGE HILL FORT By the time you read this, demolition of Fort Hill School will be well underway. It is our understanding that only the footprint of the school will be available for development, but whether that is of just the building itself, we don’t know. There is some art work there – The Watchers by Rachel Fenner, but we do not know if that will be saved. You are invited to the AGM on Tuesday 26 March 2019 at 7.30 at Church Cottage. Thank you to all our members who have renewed their membership. If not, then please do so without delay or come to the meeting and do it then. Thank you. Refreshments and view of exhibits. This will include our photos of the town’s WW2 surviving structures and of our ‘Old Walls’ Project. Steve Coull is Director of FSL Interiors, who have designed for this iconic building, which is such a well-known landmark. The White Building has been short-listed for an award by the First Time Buyer Readers’ Awards, 2019, for best off-plan development. We welcome new committee members and if you are interested then please contact us using the link. All members are welcome to attend meetings of the society. At most meetings we consider planning applications which fall within the area of concern to the society and agree comments. Meetings are NORMALLY on the 3rd MONDAY of each month and are held in Queen Mary’s College at 7.30. Check at the enquiry desk which room we have been allocated, normally in the corridor immediately to the left on entering the main door. Look at our website at www.bas-herit-soc.org and follow us on Facebook for photos and events! Non-members are welcome to the AGM and talk, with a charge of £2. 4.3 Election of officers previously nominated. 4.4 Election of committee members. The following have indicated their willingness to continue.